Ralph Waldo Emerson, Washington Irving, James Fenimore Cooper, Nathaniel Hawthorne. 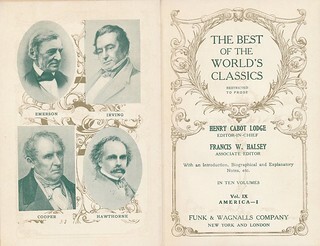 The Best of the World's Classics, 1909. America- I - Vol. IX. Author photos, engravings or lithographs. Author photos, engravings or lithographs. Ralph Waldo Emerson, Washington Irving, James Fenimore Cooper, Nathaniel Hawthorne. The Best of the World's Classics series, restricted to Prose. Henry Cabot Lodge, Editor in Chief. Francis W. Halsey Assoc. Editor. Funk & Wagnalls Co. NY. 1909.